Imagine sipping on a glass of wine, having fun with your family and enjoying the flowers in your garden. But where would you sit if you want to do all this? That is why you need an outdoor gazebo to spend your time in the garden. Gazebos are garden structures that are strategically placed in a spot where you can get a panoramic view of the garden and your house. 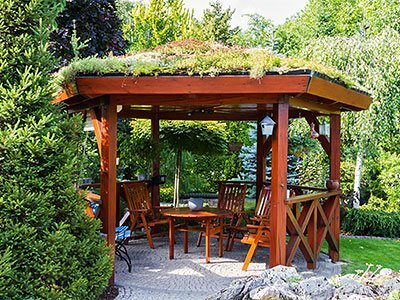 If you have dreamt of having a villa-style garden and gazebo then look no further and give us a call at Unlimited Landscape Hawaii LLC. We have dozens of amazing ideas for your patio. We even suggest the right patio furniture that would suit your requirements and budget. We try to make the outdoor living space an extension of your indoor living space and that is why we take pride in designing and installing gazebos that are spellbinding and comfortable. In addition, we will landscape it and ensure your outdoor furniture fits seamlessly with the design and other garden features. A professional landscape designer will give you several ideas about adding additional features. You can have a pond with koi fish surrounding the gazebo, for example. If you are worried about your pets and small children at home, our experts have solutions for that as well. Consider having a waterfall just by the side of the gazebo. You can relax here every evening and sleep to the sweet sound of gushing water. 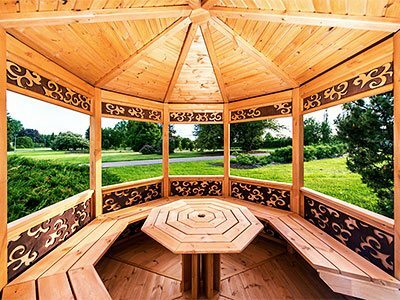 Moreover, you can further customize your garden and gazebo based on individual concepts. Some of them are Hawaiian gardens, Thai style, Zen and Chinese miniature gardens. Look for ideas in a home decoration magazine or on the Internet. If you like something, save the picture and show it to your landscape designer. They can give you the best possible options to help your interest come alive. If you are looking for the right landscape designer who is professional, creative and prompt, give us, Unlimited Landscape Hawaii LLC, a call at 808-726-9495 and we will be glad to make your dreams into a reality. We have a lot of experience in designing and installing gazebos across Hawaii and have serviced areas, like Hawaii Kai, Waipahu and Ewa Beach.